The rubella titer checks the rubella blood antibody level for immunity. What is a rubella titer? A rubella titer, or rubella blood test, checks for evidence of rubella immunity in the blood. Why is a rubella blood test important? This rubella titer helps prove immunity to rubella for healthcare students and employment compliance. This Rubella Titer is a blood test. The rubella titer, also known as a rubella test and rubella blood test, measures the rubella antibody titer blood level to check for rubella immunity. Rubella is an infection caused by the rubella virus. Sometimes known as the German measles, rubella is a common infection that is spread through the droplets from an infected person. Rubella typically causes relatively mild symptoms such as a fever, rash and fatigue. The rubella blood test is a way to check for rubella immunity. Proof of rubella immunity is often needed for employment compliance and by students in healthcare programs. Because most people have received a rubella vaccination in the past, getting a rubella titer test is a way to avoid unnecessary rubella revaccination (via the MMR vaccine). To get a rubella titer near you, order online and get tested at the Quest Diagnostics lab that you selected. Once your rubella lab test report is ready, it will be available for download. 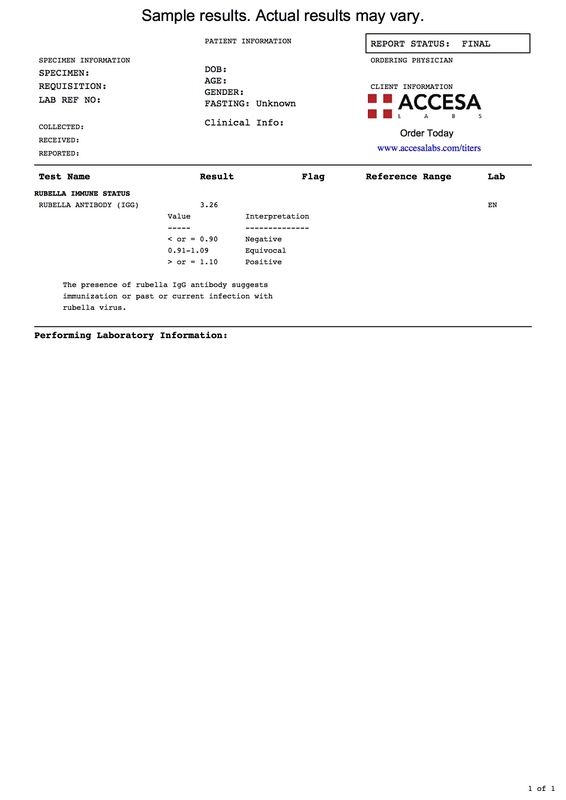 As can be seen on the sample rubella lab report above, the rubella IgG antibody blood level will be reported as a number and can be compared against the reference range provided by the lab. The rubella titer is often ordered with the measles titer and the mumps titer, all of which comprise the MMR titer. The rubella titer measures the rubella IgG antibody levels in your blood. Positive results mean that you are considered immune to rubella according to accepted international standards. Rubella titer results are not difficult to interpret. On the rubella sample report provided above, the rubella IgG antibody level is reported as 3.26. In comparing the rubella test result against the reference range, the result is considered positive. A positive rubella IgG antibody level, as the report states, suggests a prior immunization. In the setting of symptoms, this might also indicate a past or current rubella infection and, if any concern, results should be reviewed with a medical provider familiar with interpreting rubella immunity lab results. For this rubella titer test, results are reported as quantitative (i.e. number) IgG antibody titer levels. We hope you found this rubella blood test report review helpful. Rubella Titer at Guaranteed Prices.